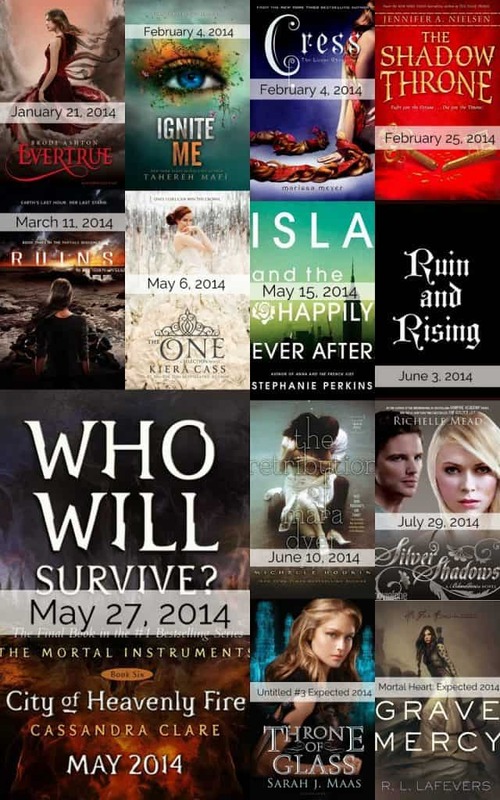 2014 is going to be a good year for YA books. We are getting the conclusions to some of my favorite series and some middle of series books that should be excellent. We are finally getting the conclusion to some series that we have been waiting years for. Here are the ones I am most excited for, in general order by release date. Evertrue– This third and final book in Everneath series features a retelling of the Persephone story. Nikki has been tricked into becoming part of the Everneath and now she must work to bring regain her mortality so she can stay with the one she loves on Earth. Ignite Me– To touch Juliette, is to sign your own death warrant. In this conclusion to the Shatter Me series, Juliette must learn to control her powers and take down the restablishment forever. I have to say this is one of my favorite dystopian series of recent years. I love the plot twists and I can’t wait to see where it ends. Cress– The third installment of a four book series featuring a Cyborg Cinderella retelling. In the first book we met Cinder, a cyborg, who falls in love with a prince. In the second book she was joined by Scarlet (Red Riding Hood) and the Wolf and this third book brings Cress (Rapunzel) into it. Something I absolutely love about this series is that while each book features a new character, it doesn’t leave characters from previous books in the dust. They work together for the end goal. The Shadow Throne– In the first book of The Ascendance Trilogy, the royal family had been secretly murdered and the cunning Conner is trying to train a peasant boy to imitate the long lost prince, Jaron. Now Jaron(?) has reclaimed the throne, but can he keep it? In the final installment, war is coming and Jaron, must fight to protect his country. I love this series, the twists and turns are fun and just when I think I have it figured out it twists again. Ruins– At the beginning of Partials, the world is almost completely destroyed after a war with the genetically engineered humans called Partials, and RM is preventing any new baby from living more than a few days. Now in the final book of the Partial Sequence Kira and Marcus must fight to prevent a final war between the humans and partials and try to save both races. Every time I start one of these books, I am so bored, but somewhere along the line I get sucked in completely. I can’t wait for this last book. The One– Thirty Five girls were chosen for The Selection. A chance to compete for the heart of Prince Maxon. America Singer didn’t want to be selected, but she was and now a whole world has opened up to her and in in the third book of the Selection trilogy, she must make difficult choices and fight to help keep the country together. Isla and the Happily Ever After- I adored Anna and the French Kiss and loved Lola and the Boy Next Door. In this third book, that features the couples from the first two, we head back to Paris as Isla learns not all love is forever. Ruin and Rising– After the events in the first two Shadow and Bone books, Alina feels broken, but she must pull herself together and fight against the Darkling because she is the only one who can. I loved the first two books in this series and I can’t wait to read more about what happens to Alina and Mal. City of Heavenly Fire– How long have we been waiting for this book? The final showdown of the Shadow Hunters vs. Demons in the Mortal Instruments series. I can’t wait to be reunited with Clary, Jace and Simon and see where their story takes us. The Retribuition of Mara Dyer– If I had to name the book I am most excited for this year, this might be it. At the end of the 2nd Mara Dyer series we were left with some shocking discoveries, we have to wait until June 10th of this year to see where they will lead. Silver Shadows– Sydney is an Alchemist, Adrian is a vampire. The two should never have become friends. Now that the Alchemists have found that Sydney is friendly towards Vampires, she will have to face her greatest demons, in everything she once believe. This 5th installment of the 6 book series is sure to be fabulous. Untitled Throne of Glass #3- We don’t have much information about this book yet, but I can’t wait to see what happens next to Celaena! Mortal Heart– The His Fair Assassins trilogy has to be some of my favorite books of all time. Nuns assassins? Need I say more? The trilogy starts off with three friends, we have heard Ismae’s story and then Sybella’s now it is time for Annith’s. Holy Smokes… I need to finish the 3 books I'm currently reading to get ready to try some of these. They all look so good! I am ALWAYS looking for a good book suggestion and love it when you do these round up posts. It looks like my list is about to expand! There are so many that look so good! I'm always looking for good book references. Thanks for sharing the ones you're looking forward too. Pinned! Oh my goodness, I had no idea that so many of my favorite series had books coming out this year! I'm pinning this so I don't forget!